Preserve childhood forever! Use the recipe to make cornstarch handprints Ornaments for Christmas tree ornaments to give as gifts to aunts, uncles, and grandparents. 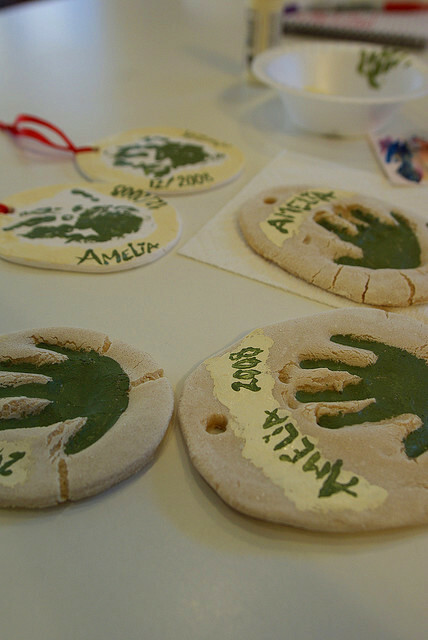 Handprint ornaments make great gifts for grandparents. Shape the dough into a Christmas bulb ornament or cut out any shape. Before you dry your ornament, push a drinking straw into the top center and remove. The hole is created for hook hanging purposes. 1.) In a heavy saucepan combine cornstarch and baking soda together. 2.) Next, add water and oil to the dry ingredients in the saucepan, stir the mixture with a wooden spoon, until it reaches a smooth constancy. Heat mixture over medium heat, stirring constantly. The mixture will boil, thicken and hold shape. 3.) Turn the mixture out of the pan on onto a plate and cover with a damp dish towel. 4.) Dust counter with cornstarch. Place dough on dusted surface. Use a rolling pin to roll out the dough. Shape into circle, heart, ornament or let your imagination run wild. 5.) Preheat oven to 350 degrees and turn it OFF. 6.) Have child place their hand or foot onto the clay and firmly press into the clay. 7.) Place the clay print on a cookie sheet and place in preheating, turned off, oven to dry. 8.) You can repeat this step several times until dry. Otherwise, you may also let the clay air dry. It will take several days. The warm oven air just speeds up the process. 9.) After the handprint ornament has dried completely, add a pretty ribbon through the hole. If you have made additional Christmas ornaments and you wish to paint them you can use craft paints to do so.